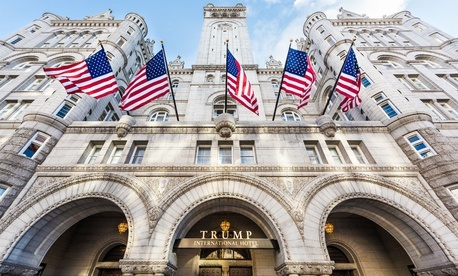 A U.S. District judge on Thursday dismissed the lawsuit brought by a nonprofit transparency group backed by restaurateurs challenging President Trump’s ability to profit from his Washington luxury hotel. The plaintiffs had cited the Constitution’s Emoluments Clause banning certain gifts from foreign governments as well as reduced profits by competing restaurants in filing the complaint. But Judge George Daniels of the U.S. District Court for the Southern District of New York, appointed by President Clinton, ruled for the Trump Justice Department, saying that the plaintiffs lacked standing and left it to Congress to apply the foreign part of the Emoluments clause. A separate suit challenging Trump’s hotel profits, brought by attorneys general in Maryland and the District of Columbia, continues, with new briefs having been filed in November.